It's a lazy Sunday; grey, cold, rainy - just a "cookie" sort of day. When I dragged out this tattered, scribbled-on, annotated-a-hundred-times recipe, I knew it was time to post it to my blog, mainly so I remember where it is!! Now, you have a yummy recipe in front of you, the rest of a Sunday to waste, no excuses, go make some cookies! In a medium bowl, cream sugar, peanut butter, and margarine or coconut oil together just until mixed. Add vinegar, water, vanilla, salt, and baking powder. Mix in flour until well blended. You may need a Tbsp. or so more flour, the dough should be "play-dough" consistency but not dry! Roll dough into 1-inch balls and place about 2 inches apart on ungreased cookie sheet. Using a sugar-coated fork, make an “x” on the top of each cookie, gently press and flatten just slightly as you do so. Bake for 9 to 11 minutes depending on elevation and oven - or until browning on the edges and firm, but not hard and crispy. Cool on cookie sheet several minutes until firm enough to remove with spatula. wow. those look so lush. they look great. my girls will want to make these! Love love love Peanut Butter cookies. Probably my fave cookie. Made these last night with some chocolate chips....so good! 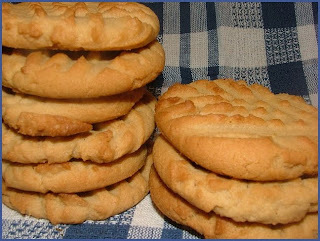 They are the first vegan peanut butter cookie recipe that I haven't needed/wanted to modify. Thanks for posting it! Why no on the Smart Balance Vegan? I've always preferred the taste of that to the Earth Balance. Maybe i shouldn't use it for baking anymore! I made these last night. They are great! Thanks for the recipe! Just finished making these... they are sooo good! Thanks for the recipe!